Many people don’t know this but Milan has one of the biggest fish markets in Italy. This makes for an enormous variety of seafood fish restaurants and bars around town. It is not always easy to find one that has amazing food but also a somewhat decent price. Zio Pesce fits the perfect combination of both! 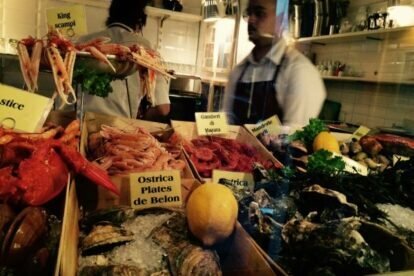 The food is great and the price is fair for eating seafood! I recommend the spaghetti allo scoglio or actually all the pasta dishes for that matter! If you live in Italy you quickly get used to good pasta and you start to become demanding! Here you won’t have to settle for average pasta! If you want to eat something different I have personally tried the grilled octopus or grilled shrimp dish many times and they are both really good! If you are in the mood for something more delicate they have a wide selection of oysters. The ambiance is friendly and not pretentious at all. Take my advice and call to make reservations as this spot is often full even on a random Monday night!